Many eyes will be on the Canadian men’s, women’s and mixed doubles teams at the second leg of the Curling World Cup in Omaha, Neb., slated to begin this Wednesday. Opponents won’t be admiring the Maple Leaf of the front of the Canadians’ jackets, but instead honing in on the targets on their backs after the Canadian teams won all three gold medals at the first leg of the Curling World Cup. Teams skipped by Winnipeg’s Tracy Fleury and Jason Gunnlaugson will represent the nation in the men’s and women’s competition. They’re joined by Kalynn Park (Calgary) and John Morris (Canmore, Alta.) as the Canadian mixed doubles team. Neither Park or Morris are playing with their regular mixed doubles partners. 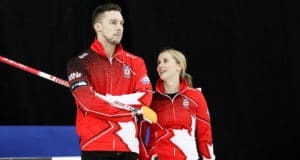 Morris and Kaitlyn Lawes struck mixed doubles gold at the 2018 Olympic Winter Games but Lawes will be taking on her regular vice-skip duties with Team Jennifer Jones. Her team will be at the 2018 Home Hardware Canada Cup in Estevan, Sask., which runs at the same time as the Curling World Cup. Park joins Morris and boasts a wealth of mixed doubles experience. She’s competed at every mixed doubles national championship since 2014 (the inaugural event was in 2013), winning gold in 2015. Park’s team lost the bronze-medal game at the ensuing 2015 World championship, but bounced back by winning gold at the New Zealand Winter Games in mixed doubles later that year. The 30-year-old curler was playing with Charley Thomas, but the duo parted ways. Park has joined forces with Braeden Moskowy, vice-skip for Matt Dunstone, this season. The mixed doubles field is packed with Olympians who dominated the podium at the 2018 Olympics. In addition to her gold medal-winning partner in Morris, Switzerland’s silver-medallists Jenny Perret/Martin Rios, and bronze-medal winners Norway (Kristin Skaslien/Magnus Nedregotten) are all part of the field. Canada and Switzerland will play out of the same pool. The nations will be joined by Sweden (Malin Wendel/Fabian Wingfors) and South Korea (Hyeri Jang/Chiwon Choi). The opposite pool comprises Norway, China (Wang Riu/Dexin Ba), Russia (Anastasia Moskaleva/Alexander Eremin) and the United States (Tabitha Peterson/Joe Polo). Park will replace Lawes in what is otherwise a rematch of the 2018 Olympic gold-medal game in opening-day action. Canada begins the Curling World Cup against Switzerland’s formidable Perret/Rios pairing on Wednesday at 6:30 p.m. (all times CST). Perret/Rios won the World mixed doubles championship together in 2017, while Rios also had a second title to his name from 2012. In women’s action, the Curling World Cup will be the biggest event yet for skip Tracy Fleury and her new lineup of vice-skip Selena Njegovan, second Liz Fyfe and lead Kristin MacCuish. Fleury, a three-time Scotties Tournament of Hearts participant, joined up with her new team this season. Fleury’s teammates have all been to two national women’s championships. They fronted Kerri Einarson’s team in 2016 and, most recently, 2018 as the Wild Card team where they advanced to the final for silver. 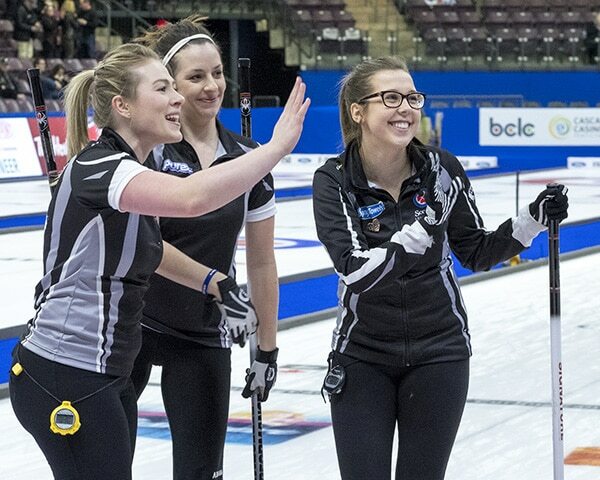 Fleury’s team is making great strides in the Canadian Team Ranking System and is coming off an appearance in the final at the Grand Slam of Curling Tier 1 Tour Challenge. The Canadian women’s team is grouped with Russia (Alina Kovaleva), South Korea (Minji Kim) and the United States (Jamie Sinclair). The opposite pool is headed by Anna Hasselborg’s team from Sweden. In addition to winning gold at the 2018 Olympics, Hasselborg is riding high after leading her team to victory at the 2018 European Curling Championships last weekend. The rest of the pool is rounded out by 2018 Olympic bronze-medallist Satsuki Fujisawa (Japan), 2013 World champion Eve Muirhead (Scotland) and China’s Yang Ying. The Canadian women open with a game against Russia on Wednesday at 3 p.m.
A fellow Winnipeg-based team is joining Fleury at the Curling World Cup. Jason Gunnlaugson will lead Canada in the competition with nearly the same lineup he had at the 2018 Tim Hortons Brier wild card game. Returning are vice-skip Alex Forrest and lead Connor Njegovan (his wife, Selena, plays with Fleury). While they lost the wild card game to Mike McEwen, they now have one of his old teammates in their new lineup. Denni Neufeld rounds out Gunnlaugson’s team at second. Gunnlaugson is coming off one of his best performances of the season at the Ashley Homestore Curling Classic, a World Curling Tour event in Penticton, B.C., with a semifinal loss against Scotland’s Ross Paterson. Gunnlaugson will get another taste of the Scots in his opening game at the Curling World Cup. 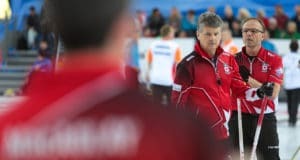 Canada begins with a game against Bruce Mouat, who is riding high after winning the 2018 European Curling Championship in late November. The teams square off at 9 p.m. on Wednesday. Also in Canada’s pool are China (Zou Qiang) and 2018 Olympic gold-medallist John Shuster of the United States. The opposite pool boasts plenty of talent too. The field consists of: three-time (2013, ’15, ’18) World champion Niklas Edin of Sweden, 2014 World champion Thomas Ulsrud of Norway, Yannick Schwaller (Switzerland) and Yuta Matsumura (Japan). All teams will play a double round-robin within their pools from Dec. 5-8. The top teams in each group move into the finals on Dec. 9. In addition to prize money, the winning teams will earn a berth to the Curling World Cup Grand Final, occurring in Beijing from May 8-12, 2019. The first leg of the Curling World Cup took place in Suzhou, China in September. Canada’s Laura Crocker/Kirk Muyres and teams skipped by Rachel Homan and Kevin Koe won gold in mixed doubles, women’s and men’s respectively. All three teams have secured spots at the Grand Final. The third leg of the Curling will occur from Jan. 30 – Feb. 3 in Jonkoping, Sweden. View the full schedule and all teams competing at the second leg in Omaha by CLICKING HERE. For more information on the Curling World Cup, CLICK HERE. TSN will broadcast select games on TSN.ca and the TSN app. For the full broadcast schedule, CLICK HERE. Previous: 2018 Home Hardware Canada Cup kicks off Wednesday in Estevan, Sask.